Chile’s ALMA telescope finds rare molecules surrounding a star, climate change has trees migrating in Peru, and Argentina’s guanacos are llama-non-grata. Guanacos are now species-non-grata in Argentina following the announcement that the llama-like animal is a “harmful species” due to its population size, its biological characteristics, and the economic and social damage they bring to the Patagonian province of Santa Cruz. The chamber of deputies of Santa Cruz declared the animal dangerous to automobiles and harmful to sheep as they compete over pastureland. 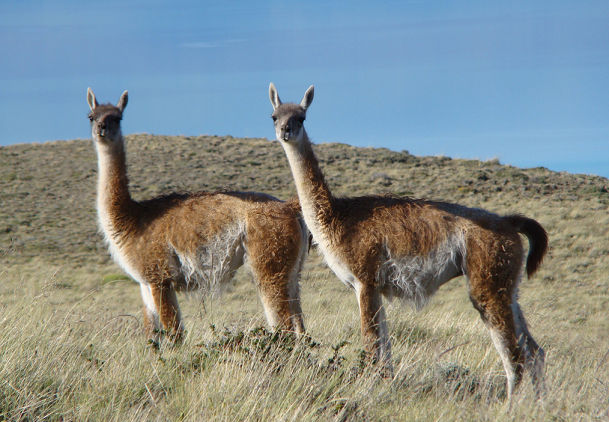 The province depends on the sheep wool industry and also hosts the largest population of guanacos in Argentina. Since the province’s announcement, hundreds of guanacos have been found dead, most likely poisoned or shot, says Veronica Chillo, an Argentine biologist and member of the Sociedad Argentina para el Estudio de los Mamiferos (Sarem). Schools in Salta, a remote arid province in northern Argentina, are using solar energy to run heating and cooking facilities. The government of Salta and organizations like the Inter-American Development Bank have funded the installation of solar ovens and water heatrers at several schools in this rural area of the country. A Patagonian province in Argentina has deemed guanacos species-non-grata. Credit: Claudio Timm via Flickr. The Bolivian Park Service has released a compendium of plants and animals living within Madidi National Park that suggests it could be the most biodiverse region in the world, announced the Wildlife Conservation Society. Madidi, located in northern Bolivia’s Amazon basin, has more than 200 species of mammals, 1,868 vertebrates, 1,200 varieties of plants, and 1,088 species of birds. Madidi National Park has an area of 7,335 square miles, about the size of the state of New Jersey. The ALMA telescope in Chile’s Atacama desert has discovered rare simple sugar molecules surrounding a star 400 million light years away. Simple sugars are molecules associated with life and are rare in space. The discovery of glycolaldehyde near the protostar IRAS16293-2422 means that molecules associated with life can exist in environments like that around young stars. The research was published in the journal Astrophysical Journal Letters. Chilean researchers are using marine algae to develop antibacterial paper that could be used to wrap fruits and vegetables. Cristian Agurto with the Center for Biotechnology at the University of Concepcion says Chile has 550 species of algae, about which not much is known. He’s working with Acex and Terra Natur, two algae commercialization companies, to mix recycled paper with algae to obtain a usable product. A Mexican scientist has developed an insecticide to combat the spread of dengue fever. MocofinBt uses the toxins isolated from the bacteria Bacillus thuringiensis (Bt) to kill the larvae of mosquitos that carry dengue, a viral disease with over 100 million cases worldwide every year. When the larvae ingest beads covered in two Bt toxins, the toxins work together to paralize and kill the insect. Similar Bt larvacides have been used in Cambodia and Malaysia to control mosquito larvae in potable water containers. Scientists hiking up into the cloud forests of eastern Peru are studying the effects of climate change on tree populations. Some trees are on the move to keep up with the changing temperatures. The umbrella tree has climbed upslope at a rate of nearly 100 feet per year. Other trees haven’t moved at all—the average migration rate is eight feet per year.